82% of occupational injuries and 90% of workplace fatalities happen in SME businesses in the EU. These are disturbingly high numbers for what are considered ‘safer’ working environments compared to large and industrial organisations. The reason? SMEs have tighter budgets than larger businesses and face greater financial insecurity. And because threats to worker safety are less visible, directors would rather invest in operations and strategy than occupational health and safety management (OHS). What they don’t realise is how detrimental this is for their employees’ health. Is the only thing protecting your employee a basic copy and paste health and safety policy? We understand why this would be the case. 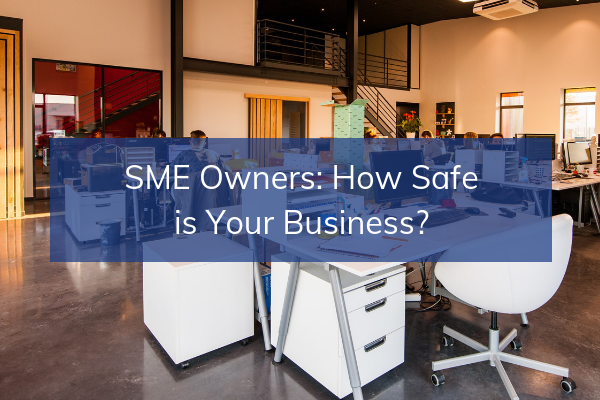 You only work in a small business so, really, the risk of incidents is low. Not only does a lack of OHS management threaten the lives of your employees but it also jeopardises the life of your business because accidents can be very expensive. The total costs of workplace self-reported injuries and ill health in 2016/17 was £15 billion, according to HSE. Injury accounted for 35% of the total costs (£5.2 billion) while ill health came in at 65% (£9.7 billion). If someone you employ has an accident within your business premises, that’s potentially going to cost you in sick days, compensation claims, other fees and loss of productivity. In other words, money you may not have to spare on an SME budget. You could also be fined heavily for breaking the law. As a business owner, there are certain health and safety regulations you must adhere to. If you don’t, you’re violating the law. Get caught and you may have to pay a fine and hourly Fee for Intervention rates to the HSE. Once you employ more than four people, you must appoint someone to assist you with your health and safety responsibilities. This can be a person within your business with suitable training, knowledge and experience, or an external provider. Unlike employment law, health and safety law is criminal law, which means you are not able to insure against fines. If you use a serviced office or have a leased space, you are still legally responsible for the health, safety, office fire arrangements and wellbeing of your employees. You must display a health and safety law poster where your workers can easily read it, or provide each worker with a copy of the equivalent pocket card. It might seem daunting at first, but getting on top of your business’ health and safety doesn’t have to be difficult or expensive. At Vita Safety, we act as your competent health and safety adviser, ensuring you have the most up to date advice, policies and procedures for health, safety and fire risk management. No tie-in to long term contracts – contract length agreed with you. Make the wellbeing of your employees part of a people-centred business strategy. It’ll help you ensure your employee are healthier and happier, improving their lives and those of their families. You also become an employer of choice. To attract and retain the best employees you need to ensure that your company’s work ethos, values and physical environment reflect your brand. An effective safety, health and wellbeing strategy is your ticket to achieving this. For a friendly chat about our range of small business service options, please contact [email protected] or call on 01614865020. We can’t wait to hear from you.